We have many great attractions on site, with something on offer for everyone! Whether you like nature, have an interest in trains and railways, want to learn more about our local history or just fancy a delicious lunch, coffee and a cake, you will enjoy your visit to the Heritage Centre. 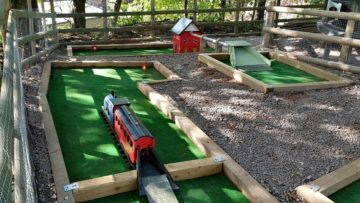 For our younger visitors there is a den building area, a play area and two nature trails to explore, whilst our ever popular garden railway and crazy golf are open at weekends and school holidays (weather permitting). Interested in local history? Our Heritage Rooms are filled with information and artifacts, whilst our exhibition building in the base of the quarry provides further detail about quarrying in the area. On selected weekends throughout the year the Great Central Railway operate trains along the line, whilst our shunting team demonstrate how wagons would have been moved around railway yards in days gone by. Look out for our upcoming events so you don’t miss the next one! All this is made possible by our dedicated volunteers who spent over a hundred thousand hours creating the Mountsorrel and Rothley Community Heritage Centre. Our Eco Team maintain our nature trails so you can enjoy an adventure winding through the countryside, whilst the Restoration Team tackle our railway vehicle restoration projects. Take a look in our Railway museum to see work in progress, or learn a little about railway history. Keep your eyes open for our Visitor Guides who are on hand around the site to reveal more of our history and ecology and answer your questions, they also help with guided tours for groups. Make sure you head over to our Attractions page to see a full list of everything we have on offer! There is no entrance fee or parking charges at the Heritage Centre, we rely entirely on our Coffee Shop, Granite’s for the income needed to pay the running and maintenance cost for the site, so during your visit we hope you can pop into Granite’s and sample some of the delights we have on offer. We have tried to make everything at the Heritage Centre as disabled friendly as possible, for further information check our disabled access page.